Who knows grass fertilizer will do no harm to my dog’s? 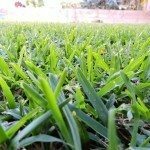 There are many organic lawn fertilizers that can be found with a google search. Most of these will pose no real danger to animals except for a possible upset stomach. We really don't recommend any brands in particular, but there are many available.